WordCamp was fabulous! Met great people, learned lots, made good connections – folks who seem as happy to connect with a graphic designer as I am to meet codie-types. Looking forward to developing lots more WordPress sites! Ready to turn the ‘page’ to more exciting functionality, and broader theme-adaptation and development. Great to be able to officially put on that UI cap once again. 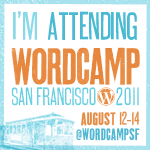 So many highlights from WordCamp… For example, learning that Carlton University uses WordPress, now that’s big! And hearing about the trials and tribulations involved with getting it to happen is encouraging…. it ain’t always easy to convince folks to make these changes! Hearing about that process of development is useful. Frankie Gershwin singing her great-uncle’s Summertime – that was amazing! Watching the bubbly, charming, and super-impressive Matt Mullenweg speak about where WordPress has been and where it’s going, with those very groovy slides; that was awesome! Speaking of awesome slide presentations, Zach Berke’s presentation was totally inspiring, and quite cool – he used Prezi…. must check it out! A great alternative to PowerPoint. Will add more highlights as I go through my notes! So much inspiration! So much enthusiasm! The WordPress community is the best!